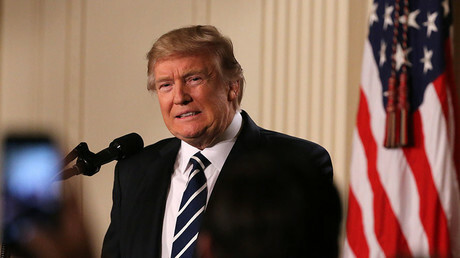 US President Donald Trump continues to polarize his country, with some mulling a military coup or even an assassination. RT looks at what lengths people who say Trump is too much for their democratic country can go. Donald Trump’s push for the presidency has been met with a certain concern in the US, but it escalated into more than just a war of words when it became clear that he was set to take the Oval Office, with violent protests gripping some of the country’s biggest cities. One of the most notable rallies with thousands of demonstrators that reached a fever pitch and later turned violent took place on Trump’s inauguration day, January 20, in Washington DC. Right before the swearing-in ceremony, several hundred demonstrators vented their anger in the US capitol, smashing windows of McDonalds restaurants or Bank of America offices, and throwing objects around. Slogans like “Revolution or Death” were seen written on some of the closed shops. 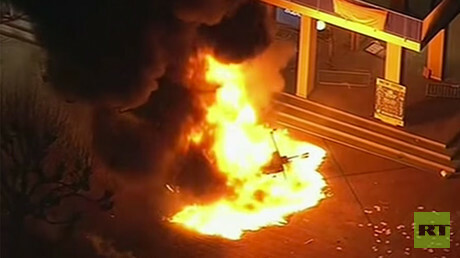 Later in the day, protesters also set a limo on fire, writing “We The People” on it. Police used pepper spray to counter the chaos and detained over 210 people, including journalists. The scenes were similar to those witnessed in the city of Oakland, California, in November following Trump’s victory. An initially peaceful march later escalated, with some of the protesters setting an office block alight and putting slogans like “f**k Trump” and “kill Trump” on its walls. Even before Donald Trump took office and issued his first executive order, people on social media were teaming up in calls to “kill” and “assassinate” him. “So who's going to assassinate Trump at his inauguration?” one person asked online. Others said that not only Trump had to be killed, but also Vice President Mike Pence. “The government need to assassinate trump the way they did [JFK],” a message said, referring to the killing in Dallas, Texas, of US President John F Kennedy in November 1963. Police later detained the man in Miami Beach after he posted the video where he also challenged the US Secret Service to stop him. Authorities have launched investigations against several people for similar tweets and charged one person for issuing threats against Trump. According to The Daily Mail, over 12,000 tweets containing calls for assassination of the US President have been issued since January 20. While the unease over Trump is far from dying down, some are also mulling ways to remove him without actually killing him. A former administration official under the previous Obama administration, Rosa Brooks, has recently suggested four ways of how one could do that. She also said that apart from waiting for the next election, which could seem “a long time to wait,” impeachment could also be a method for anti-Trump political forces to pursue. Another possible option would be to invoke the 25th Amendment to the US Constitution, which paves a way for the removal of a president from power if he “is unable to discharge the powers and duties of his office” and transferring them to the Vice President, Brooks said. Brooks hinted that that scenario could conceivably happen if Vice President Mike Pence were interested in taking over the presidency. In a similar opinion to that voiced by Brooks, left-wing US actress and comedian Sarah Silverman also appeared to hint at a possible military uprising against Trump. “WAKE UP & JOIN THE RESISTANCE. ONCE THE MILITARY IS W US FASCISTS GET OVERTHROWN. MAD KING & HIS HANDLERS GO BYE BYE,” she wrote on her Twitter account, which has nearly 10 million followers. Silverman is by far not the only celebrity to stir controversy in the anti-Trump debate. During the global Women’s March earlier in January – which was largely viewed as an anti-Trump protest – US star Madonna also weighed in. During her speech in New York, Madonna three times said, “F…k you [Donald Trump],” while voicing her “outrage” over his election. Madonna claimed she even “thought about blowing up [the] White House,” but stressed she had opted for the culture of peace and “love” instead. Following the death of US actress Debbie Reynolds, movie and TV show star Charlie Sheen also pulled no punches over Trump getting elected. In a Twitter post, he wrote “Trump next, please!” six times, with the message quickly gaining popularity among his followers. While many people vented their anger at Trump personally, some also had his supporters in their crosshairs. Prior to the presidential polls, a debate between a Trump supporter and his friend saw another person meddling in and pulling out a gun in the US city of Cleveland. Paul Jones told a local WCPO news channel that he was discussing his support for Trump when another person tried to intervene and after running out of the bar, came back with a gun shooting at Jones, who got injured but survived. In another case, after Trump’s election a man in the US who allegedly told a Hispanic person that Trump was going to deport him was shot and killed by him. And just recently, in the US city of Berkley, California, which has been hit by student protests, a man who wore a cap with Trump’s slogan, “Make America Great Again” was attacked. The perpetrator stopped the vehicle and jumped on the man tearing off his cap, CBS reported. The suspect and his accomplice were later arrested by police. According to renowned British journalist and author John Pilger, the unease against Trump is actually missing the point. Instead, people in the US should focus on establishing real opposition if they want to proceed with their goals. “Until real politics return to people's lives, the enemy is not Trump, it is ourselves,” he said.